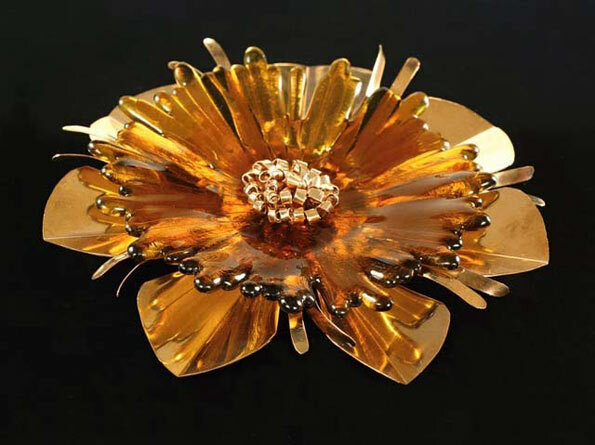 Join us for the April reception featuring Linda Herd and Karen Miller. Music will be provided by guitarist, Billy Lanham. 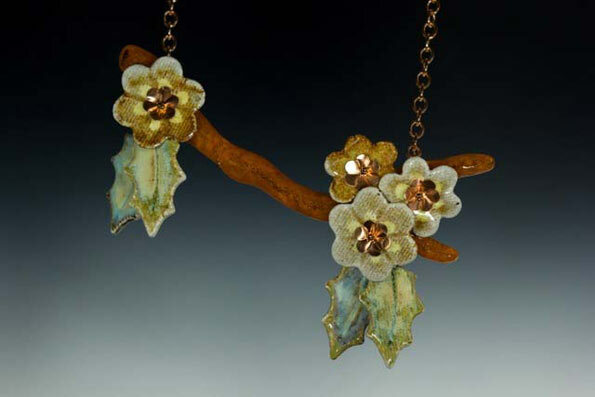 See new Linda’s newest magical jewelry and Karen’s latest fabulous fabric pieces! This entry was posted in and tagged Karen Miller, Linda Herd, Reception on April 5, 2019 by Rob Robinson. An artist’s reception from 6 to 8 p.m. Friday, Feb. 1, will include the art work of the 20 member artists of Gallery Calapooia as well as The Big Show of Little Art (aka 8 x 8 Exhibit). Cookies and punch will be served. This show was a big hit last year and we look forward to seeing all the creative artwork by local artists. The second annual 8 x 8 Exhibit will run from Jan. 29 – Feb. 22. Come see the 200+ artworks! This entry was posted in and tagged Gallery Calapooia, Reception on February 1, 2019 by Rob Robinson. This entry was posted in and tagged Anna Harris, Gallery Calapooia, Reception, Shannon Ross on January 4, 2019 by GCWebCoord. Join us for our December First Friday Reception from 6 – 8 pm on Dec. 7. 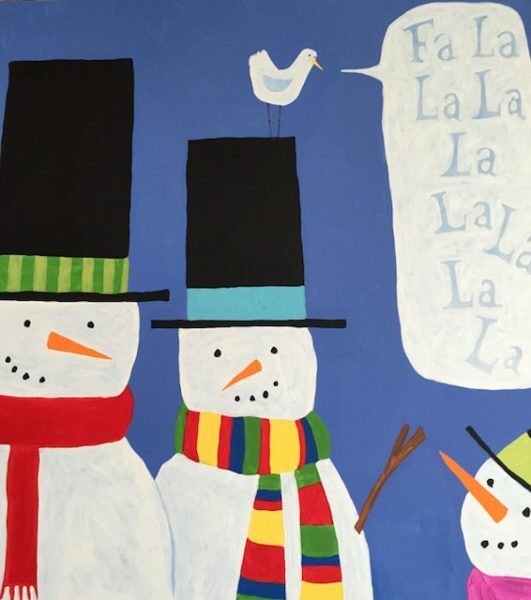 The Holiday Group Show will run through – Dec. 29. Appetizers, beer, wine and hot cider will be served. 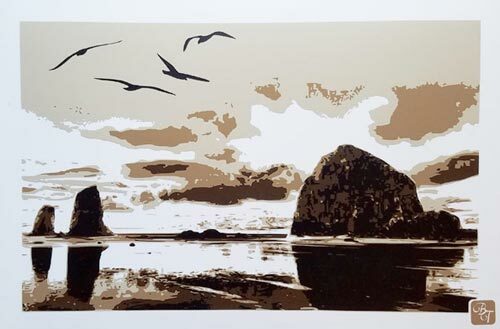 This entry was posted in and tagged artists, Gallery Calapooia, Reception on December 7, 2018 by Rob Robinson. Join us for our November First Friday Reception from 6 – 8 pm on Nov. 2. This reception is celebrating our Holiday Group Show which will run from Oct. 30 – Dec. 29. This entry was posted in and tagged Gallery Calapooia, Reception on November 2, 2018 by Rob Robinson. 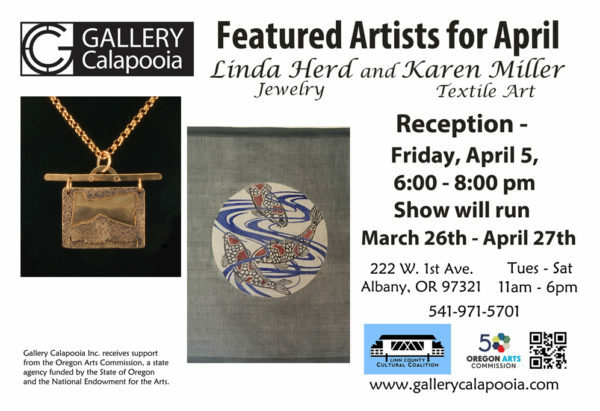 Gallery Calapooia’s 5th Year Anniversary Celebration! Please join us at Gallery Calapooia for our Fifth Anniversary Celebration, from 6 to 8 p.m., Friday, Sept. 7. 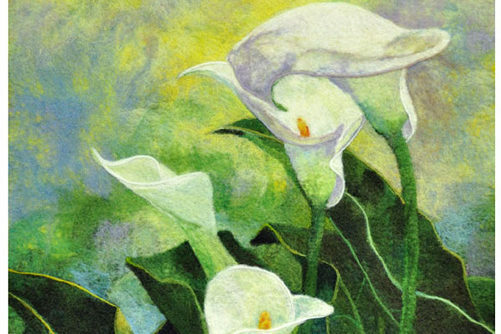 This First Friday reception will feature the art of former members as well as current members. Come enjoy their special artistic creations, and celebrate the wonderful friendships made in these five years. Refreshments will include delicious hors d’oeuvres by Sybaris Restaurant and sweet treats by our members, as well as beer and wine. We’ll be treated to the lively music of String Theory with Tom Hughes on mandolin and guitar and Kim Collar on guitar and violin. This entry was posted in and tagged exhibit, Gallery Calapooia, Reception on September 7, 2018 by GCWebCoord. 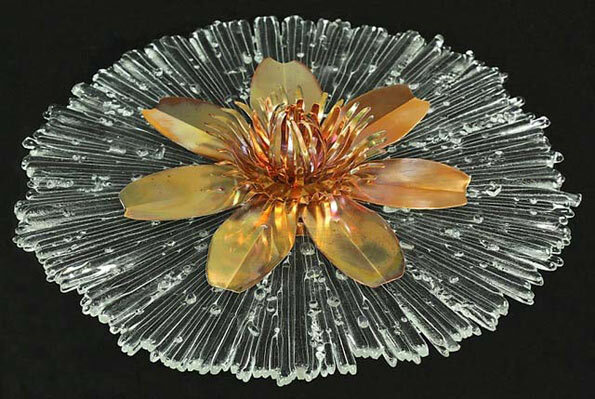 Featured for August are glass artist, Cindy Conder, and sculptor and jewelry artist, Lori Garcy. 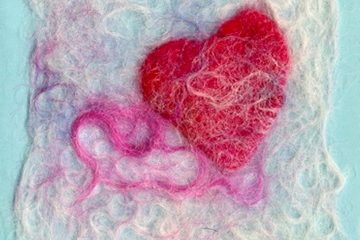 Come see their individual work and the beautiful new collaborative pieces that they have created together at the August First Friday Reception, August 3 from 6:00 – 8:00pm. Being an artist is mostly a solitary venture. Artist work alone in their studios thinking about, designing and making their art. Rarely do they get the opportunity to collaborate with other artists. Cindy and Lori decided to take on the challenge of creating art together that combined Cindy’s glass pieces with Lori’s metal work. Out of this collaboration some very beautiful pieces were designed and created. Both mediums have limitations that required both artists to be flexible. 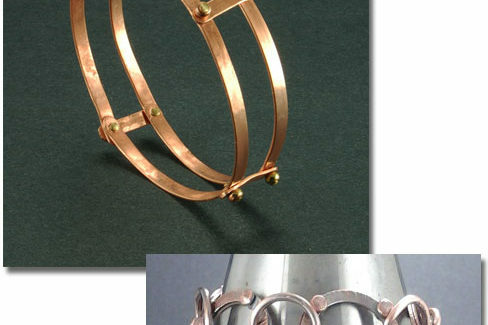 Lori asked Cindy to make pieces in a certain form and then created the metal sections. Both artists went back and forth making suggestions on how it could be better. Not all the suggestions would work because of the uniqueness of the glass and metal. 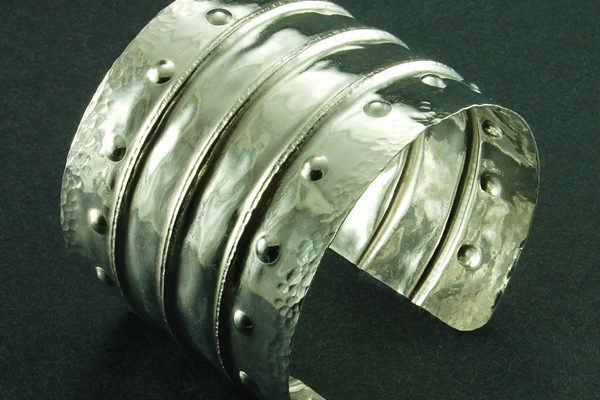 Their first collection of pieces will be shown at Gallery Calapooia during the month of August. They hope to continue their collaboration in the future. This entry was posted in and tagged Cindy Conder, Gallery Calapooia, Lori Garcy, Reception on August 3, 2018 by Rob Robinson. Join us the first Friday of April, the 6th, from 6 – 8 pm. 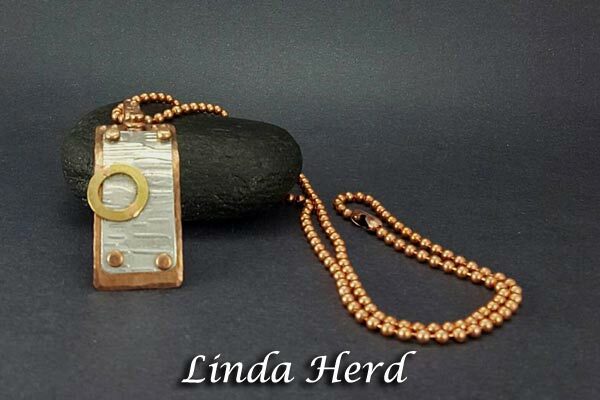 Linda Herd, jewelry maker, and Dan Bourdet, , oil painter, will be the featured artists. Enjoy the party and see Linda’s and Dan’s latest artwork. 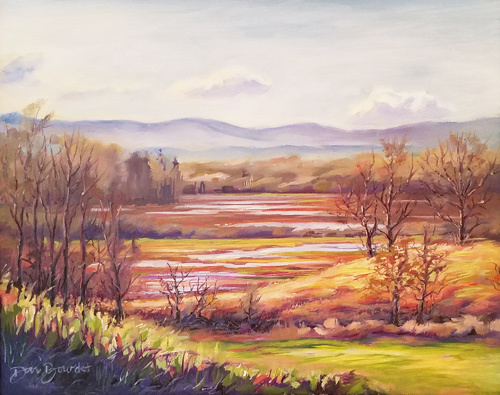 This entry was posted in and tagged Dan Bourdet, Gallery Calapooia, Linda Herd, Reception on April 6, 2018 by Rob Robinson. Join us on Friday, March 2 for our First Friday Reception with featured artist, Bill Thompson and the other Gallery Calapooia artists. Enjoy some complimentary appetizers and sip some wine or beer while viewing Bill’s layered vinyl artwork along with the latest work by other GC artists. This entry was posted in and tagged First Friday, Gallery Calapooia, Reception on March 2, 2018 by Rob Robinson. 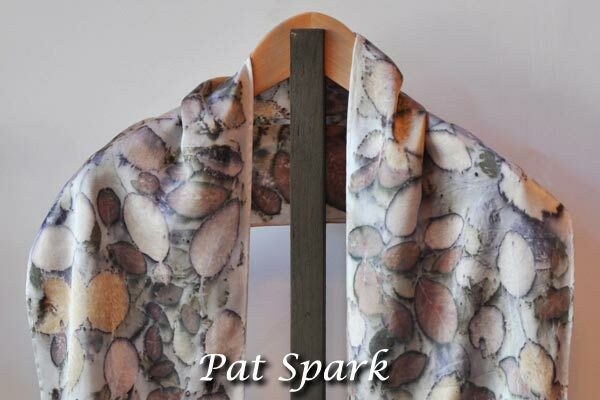 For August, Gallery Calapooia’s featured artists are Pat Spark and Linda J. Herd. 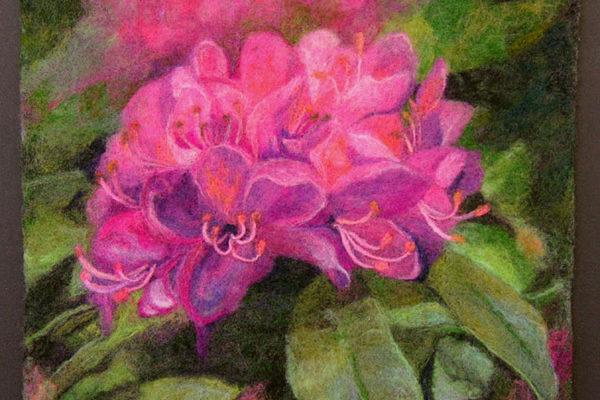 Pat has been making felt for over 30 years and has been a watercolorist for about the same amount of time, but it’s only in the last few years that she has been combining the two. 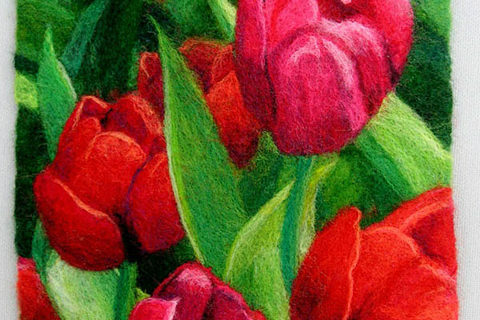 That is, taking concepts from her painting, and applying those concepts to her feltmaking. The result is the watercolor series. 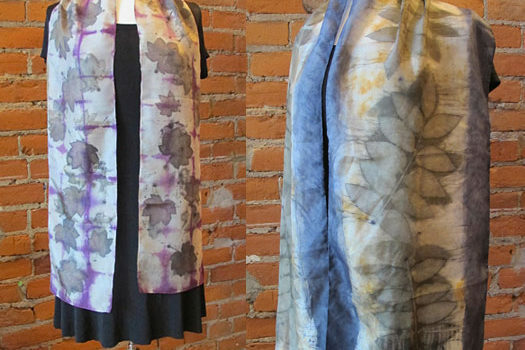 Felts that are conceptually similar to watercolors, but which are totally made of dyed fiber. There is no actual painting involved, unless you consider the placement of each individual colored fiber as “painting” with the fiber. 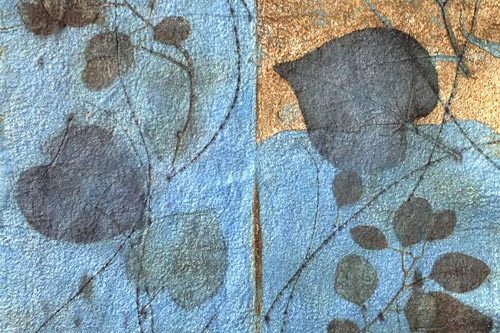 With these works, she creates rich backgrounds and uses those backgrounds to help define the foregrounds. By themselves, the foregrounds would be flat, but by making the backgrounds visually exciting, the foregrounds are enriched. 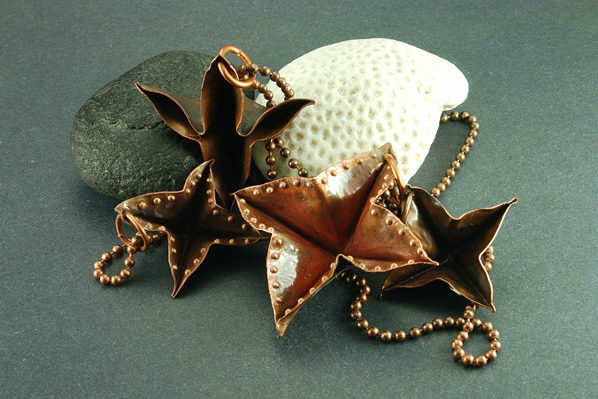 Linda States: “Inspiration for my designs comes from materials, environments, and lifestyles. The influences of the urban sophistication of New York and the natural beauty of Oregon combine to give my work a distinctive look. My studies in architecture and urban design have taught me the impact detail has on style. 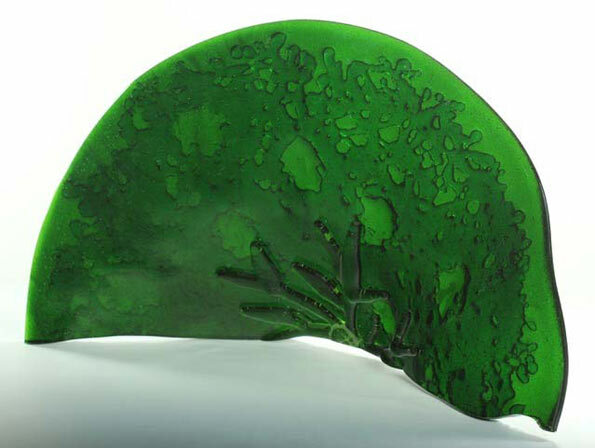 It is my firm belief that jewelry should make a statement, not a suggestion; my designs reflect that principle in their boldness of scale, texture, and color. Design has its challenges, including learning new skills and incorporating new materials. 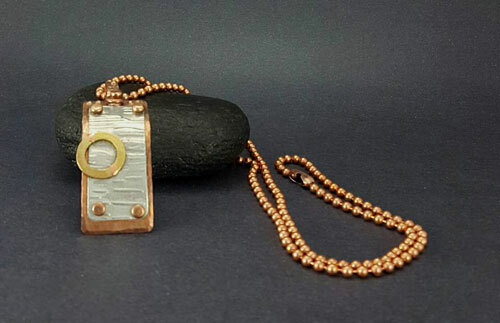 The ever escalating cost of silver has prompted me to start using copper and other metals. I am inspired by the work artists, architects, and designers such as Alexander Calder. Charles Rennie Macintosh,. and William Morris. Learning new techniques and skills brings a fresh perspective to my work. I look forward to adding even more creative skills to my design catalogue. Come join the fun at the First Friday Reception with wine, beer an appetizers, and meet the artists. This entry was posted in and tagged Gallery Calapooia, Linda Herd, Pat Spark, Reception on October 6, 2017 by GCWebCoord.